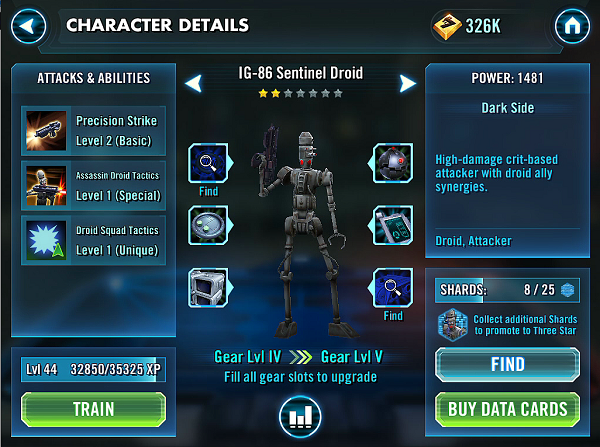 IG-86 is a ranged assassination droid with high damage and high critical rate. This brief guide will give you a rough idea of what he can offer to your team. Basic Ability: Precision Strike – Deal Physical damage to target enemy with an additional 50% chance of a Critical Hit. Special Ability: Droid Squad Tactics – IG-86 gains 4.5% Critical Chance for each living Droid ally. 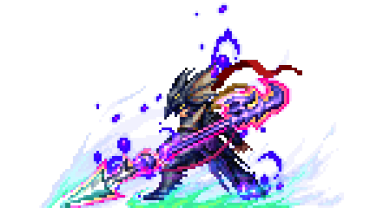 In addition, he has +15% Critical Damage. IG-86 is a surprisingly good unit when alone and gets better when you team him up with Hk-47(as leader) and IG-88. Anytime he criticals, you can feel the pain incoming. A great team setup for the high damage droid squad is Hk-47/IG-88/IG-86/Poggle the Lesser/Old Daka. Until we can get a good droid healer, this team will wreck faces when they are highly geared. Old Daka can revive your droids if they ever go down. Plus, most enemies will get focused down and die before you know it. The only weakness to building a strong droid squad is the anti-droid characters such as Ima-Gun Di/Dathcha/Jawa/Eeth Koth. You will meet them mostly in the arena, so do not worry too much about it. Otherwise, you won’t regret getting him to max level and enjoy Max Payne. Verdict: Max him only if you run a droid squad. Actually if you run him along Geonosian soldier both are quite good for arena.